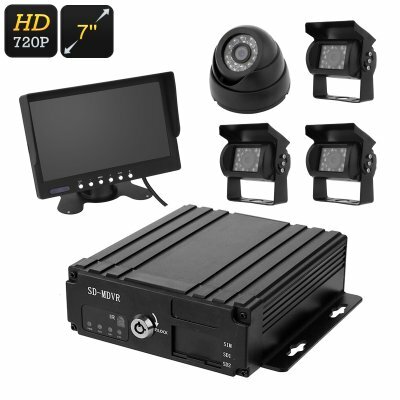 Successfully Added 4-Channel Car DVR - 4x HD Camera, 7-Inch Display, IP67, 256GB SD Card Support, Play Back Mode, 120-Degree Lens, 10m Night Vision to your Shopping Cart. This 4-channel car DVR lets you keep track of all what’s happening around your bus or truck. It comes with 4 HD cameras that each can be placed on one side of your vehicle. Thanks to this, nothing that happens surrounding your truck will stay uncaptured. On its crisp 7-Inch display, it provides you with a live view of all recording. Therefore, you won’t be left with any dead corners while driving your long vehicle around in busy places. This will significantly increase your own safety but also that of others around your truck or bus. The display features a 130-degree rotating design to guarantee you’ll be treated to a solid viewing angle no matter where it’s placed in your car. The car DVR kit comes with a front, rear, left, and right-side camera. Each camera delivers crisp video in HD resolutions. Therefore, you’ll be able to enjoy detailed and clear images of anything your DVR records. With a 256GB SD card slot, there is plenty of space available to keep your footage. All video can be equipped with a time and date-stamp which will provide great information on what exactly happened at a certain moment. Thanks to this, you’ll never be bothered again by false insurance claims while being part of an unfortunate accident. Each camera features an IP67 waterproof design. You’ll be able to place them outside your vehicle with confidence as no amount of rain, snow, or dust will stop these beauties from working. They come with a 120-degree lens to provide you with a clear and wide overview of all that’s happening. With their 18IR LEDs, they even provide you with 10-meter night vision capabilities. On your 7-Inch display, you’ll be able to enjoy live footage as well as replay previously recorded film. Recordings can additionally be watched back on your PC or laptop when using the SD card. This 4-channel car DVR comes with a 12 months warranty, brought to you by the leader in electronic devices as well as wholesale car gadgets..